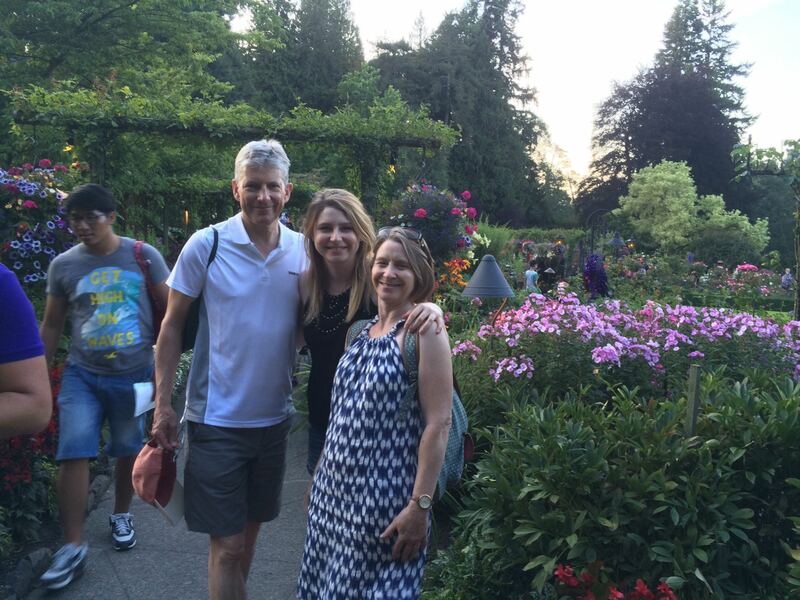 A few summers ago I flew out to meet my family, who had been spending their holiday in Vancouver, Canada. 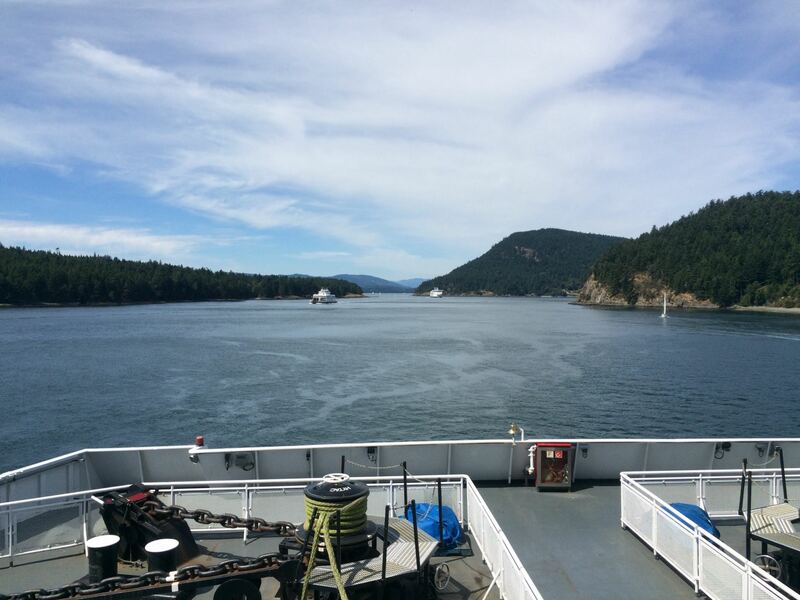 They picked me up from the airport and we set out for Vancouver Island, a short hour and half ferry trip away. 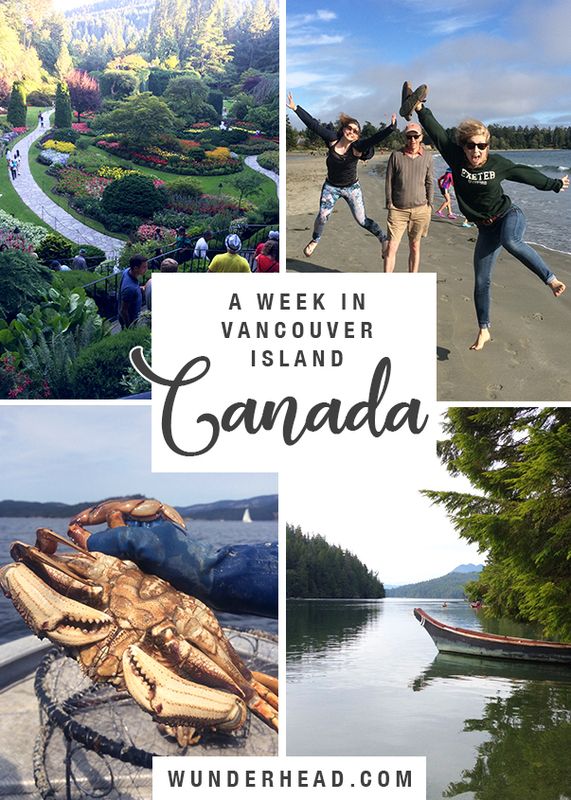 We were really lucky with our trip, since Rosie’s friend Mel had spent a whole year in Tofino for her gap year, and one of dad’s friends actually lived on the east coast in North Saanich, so we had some first class recommendations for where to go and what to do. The ferry to Vancouver Island departs from Tsawwassen in Vancouver and arrives at Swartz Bay, on the north peninsula of the island. There are also a few airports you can fly into. 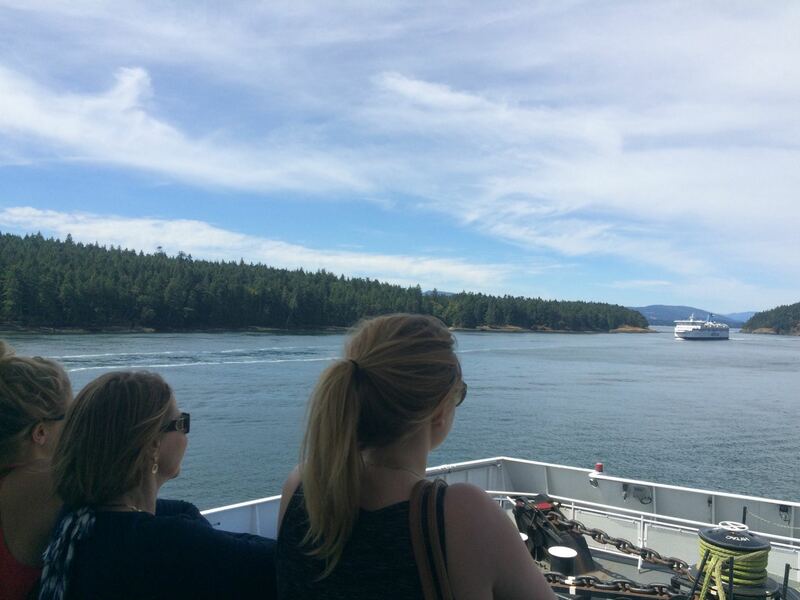 Navigating between islands towards Swartz Bay. I bet you’re wondering about the name “Tsawwassen” huh? So was I. I did some research and it turns out the peninsula and surrounding lands are the ancestral home of the Tsawwassen First Nation, a Coast Salish people, who it’s said have lived there for over 4,000 years. In fact, 8 different prehistoric villages have been unearthed in and around the area. My sister Rosie, mum and I on the deck of the ferry. Fun fact – Swartz Bay, where the ferry lands on Vancouver Island, was named after the original land owner John Aaron Swart in 1876, but it was spelt wrong on all the paperwork when it was transferred to the government. Canada is a crazy place. In Deep Cove, the neighbourhood of North Saanich where we started our week, some of the native animals include cougars, deer, mink, otters, raccoons and bald eagles. A raccoon actually came and visited us on our deck a few times as we were chilling out and enjoying the view over the water. 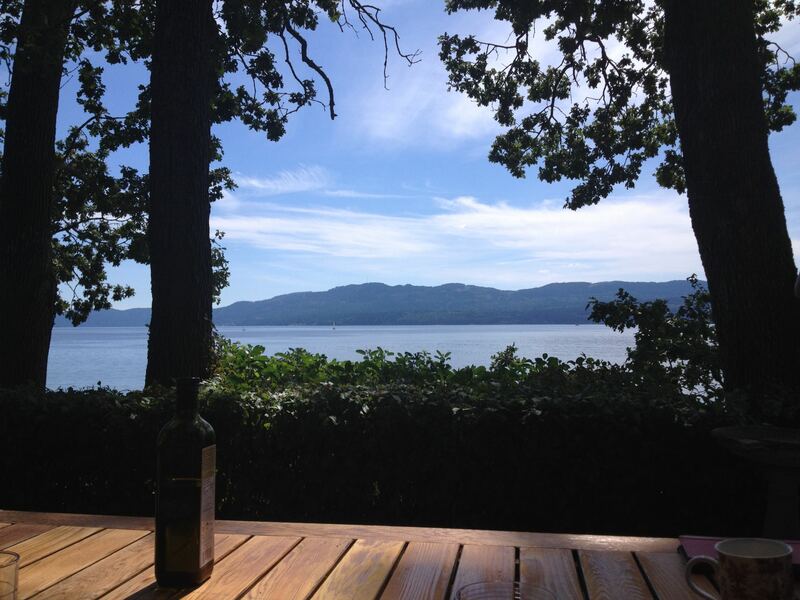 The view over Saanich Inlet from the deck of our holiday home. All the houses along the marina in Deep Cove have enormous windows so you can get the most from the view, and ours was no exception – graciously opened to us by Dad’s friend Alistair, who moved to Vancouver Island to spend his retirement amongst this beautiful scenery. 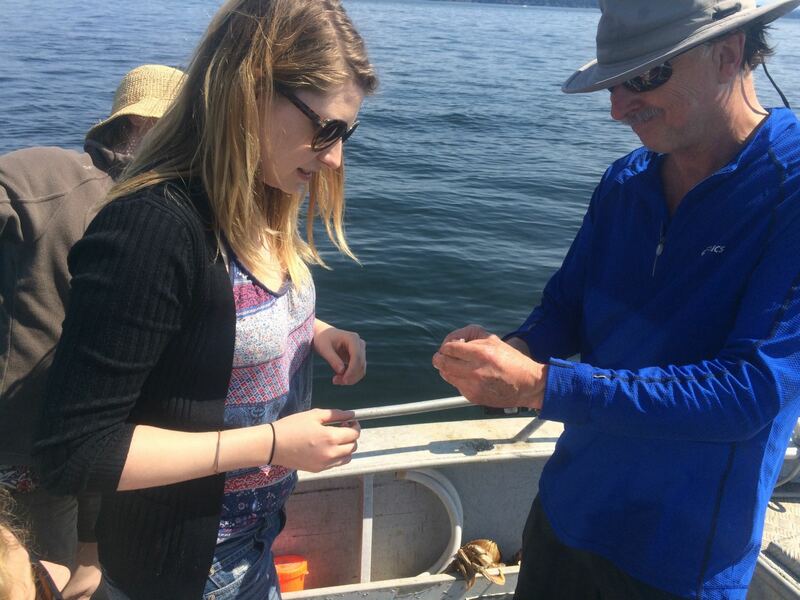 Lucky for us, his neighbour Bob popped up and invited us out on his little fishing boat to inspect his various crab and shrimp traps in the deeper parts of Saanich Inlet. Setting off from Deep Cove Marina. 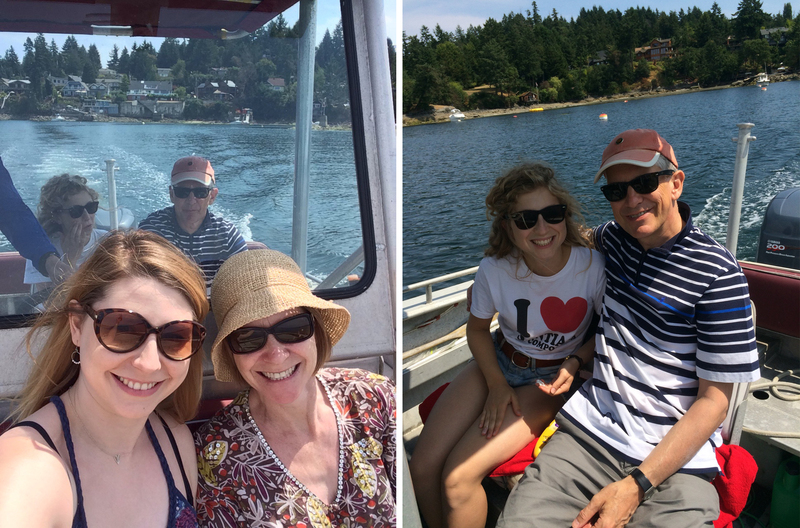 We spent the morning on Bob’s boat, jetting around Saanich Inlet – so large it could be its own sea – ringed with misty mountains, the shoreline dotted with little houses and jetties. 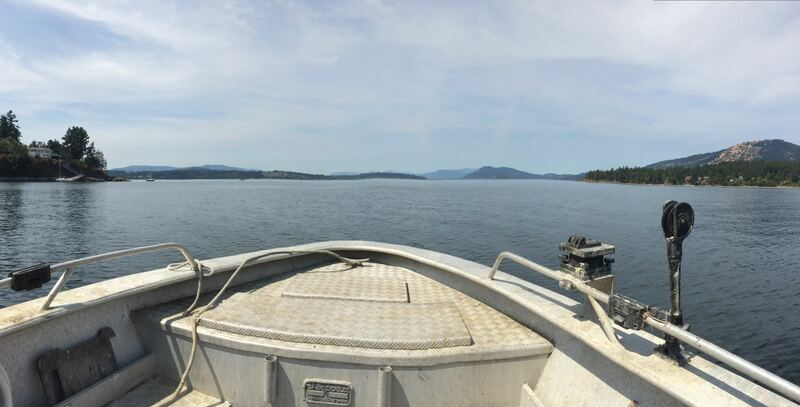 The view of Saanich Inlet from the bow of Bob’s fishing boat. Left: Boat Selfie. Right: Rosie and dad chilling out in the back. You need to have a license to set up shrimp and crab traps, but it seems most of the locals of Deep Cove have invested in one. 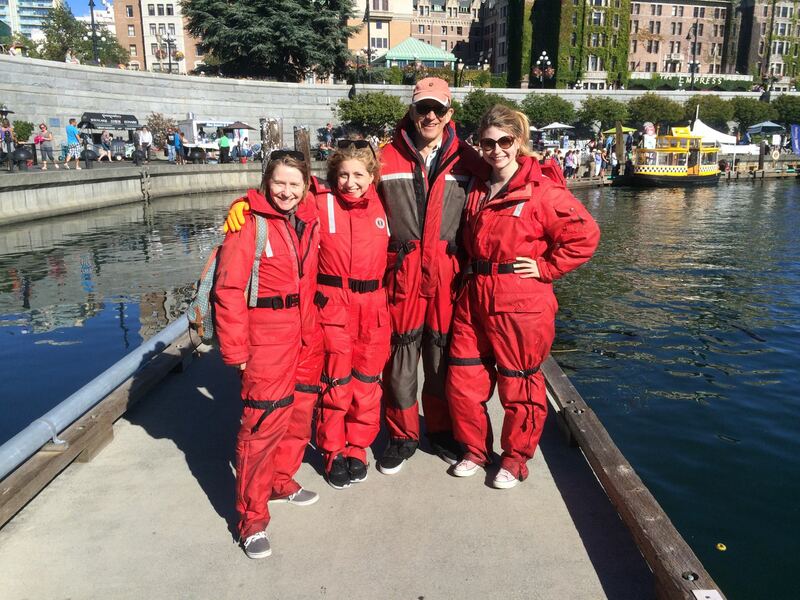 Bob told us all about how commercial crabbing has greatly reduced the amount of wild crabs in the local waters. 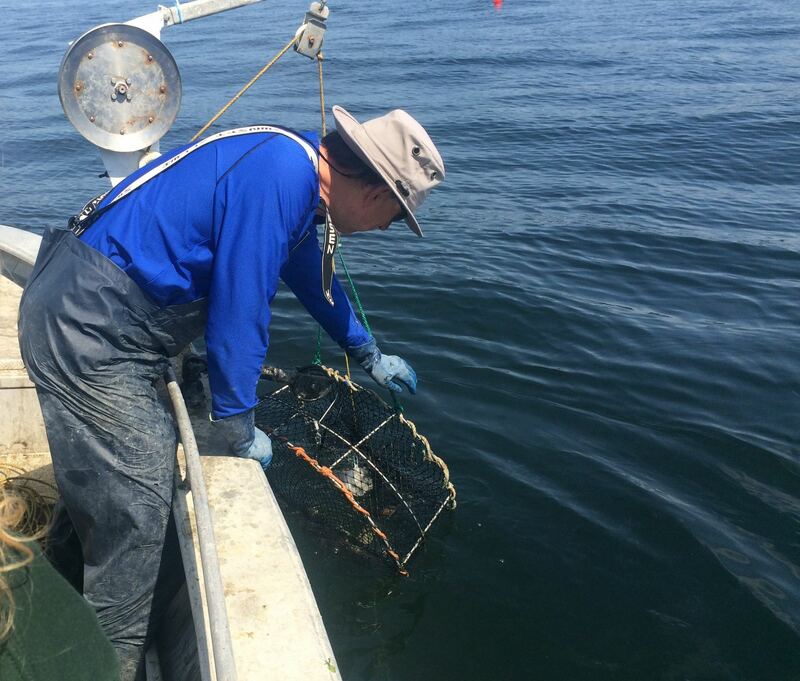 Pulling up a crab trap to see what’s inside. Crab traps used to fill easily, but commercial fishing has reduced the local sea life population. 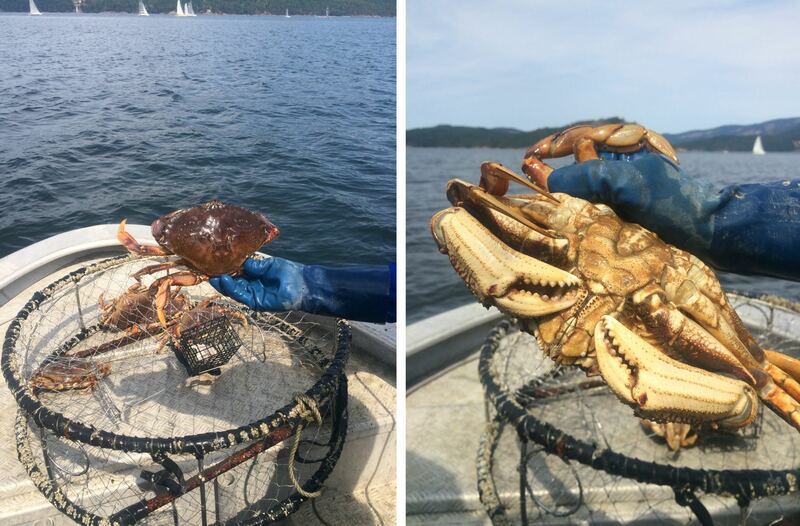 After pulling each crab from the trap, Bob inspected them for size – your license covers what size crab you’re allowed to keep, any smaller and you have to toss it back. Well, I love sashimi, so I decided to go for it. Bob wrenched the head off the shrimp, peeled back the shell and handed it to me. There’s no fresher than literally watching it be killed in front of you. I’m telling you, raw fresh shrimp is one of the tastiest things I’ve ever eaten. The flavour and texture is exactly like the best quality salmon sashimi you can buy – perfectly tender with a fruity yet buttery taste. 10/10 would try again. And I hate shellfish! 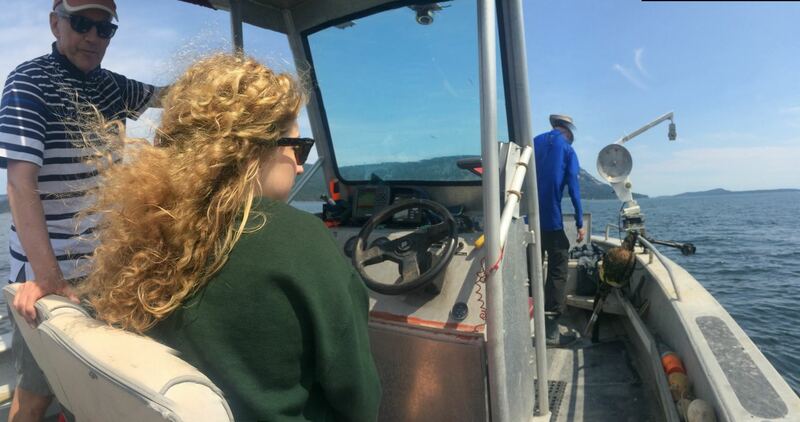 Rosie at the wheel while Bob tends to his traps. After our day on the water we returned to Bob’s house on the marina. 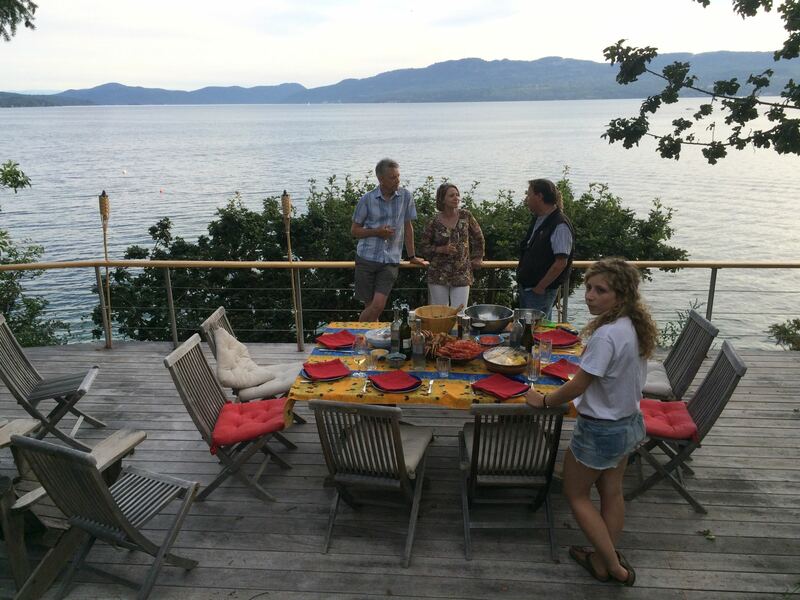 Before long his beautiful deck overlooking the water was all set for dinner, with salads, corn on the cob, chilled white wine, and grilled shellfish paired with his own homemade dipping sauces. Table set and ready on Bob’s deck. Like I said, I don’t usually like shellfish, I certainly would never order it at a restaurant, but with the day we’d just had I couldn’t possibly pass it up. The sauces were totally delicious (tahini mixed with rice wine vinegar and lemon juice if I remember correctly) and went perfectly with the catch of the day. 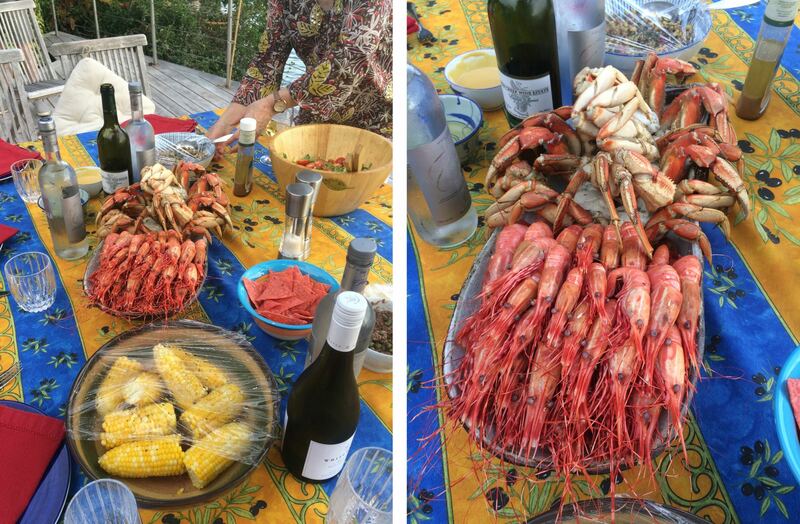 I’ll be honest, even after this experience I’m still not a massive fan of crab or shrimp. I mean blimey getting all the shell off a crab takes so much time, is it even worth it? And would you just look at how gross shrimp are? If I’m not converted after this I think it’s time to throw in the towel. 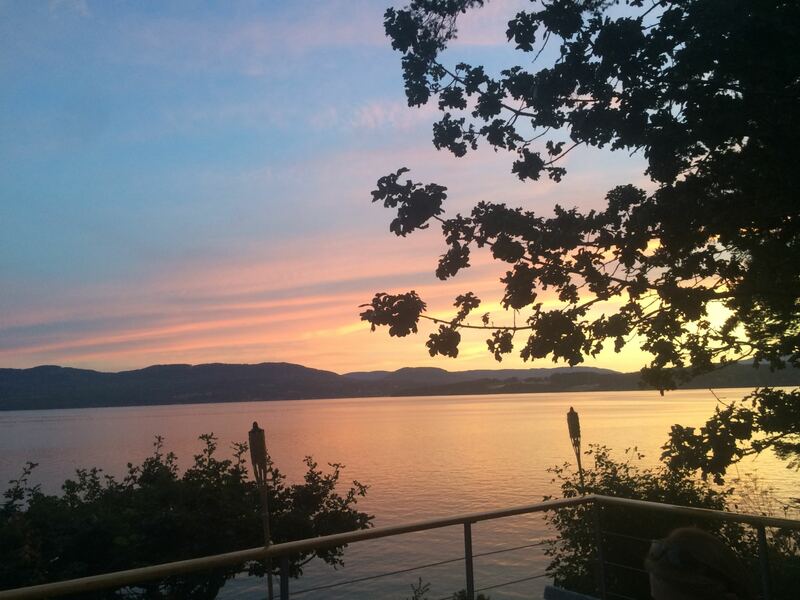 Beautiful sunset over Saanich Inlet. Something absolutely not to be missed if you’re in the area is the Butchart Gardens, famous around the world, attracting over a million visitors a year. Established in 1904 by Jennie Butchart, the gardens are a designated National Historic Site of Canada. It’s made up of lots of smaller themed gardens, like a Japanese garden, Italian garden and a rose garden, which Jennie commissioned from various garden designers from around the world. Her husband Robert made his fortune from manufacturing cement, and after his limestone quarry was exhausted, Jennie turned that into a garden too. Admiring the flowers in the Rose Garden. The Butchart family still own the gardens, and have expanded and added to it over the century since it first opened, with a menagerie, fountains, pavilions, night illumination and summer firework displays. Left: The Sunken Garden in the old quarry. Right: The sunset from the Japanese Garden. 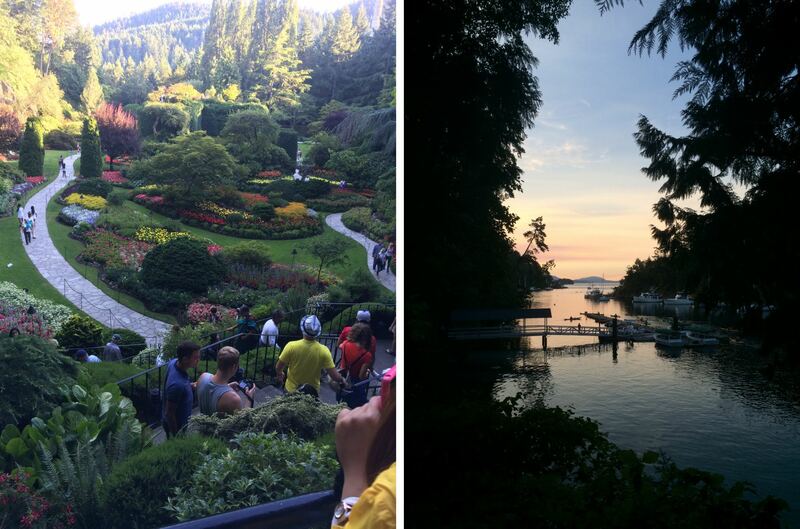 We actually went to the Butchart gardens for a whole day, having dinner at the Blue Poppy and watching the fireworks and water display after sunset. On the southern end of Vancouver Island, Victoria is actually the capital of British Colombia. There are a bunch of very colonial styled castles, and some impressive parliament buildings, as well as lots of trendy bars and shops. 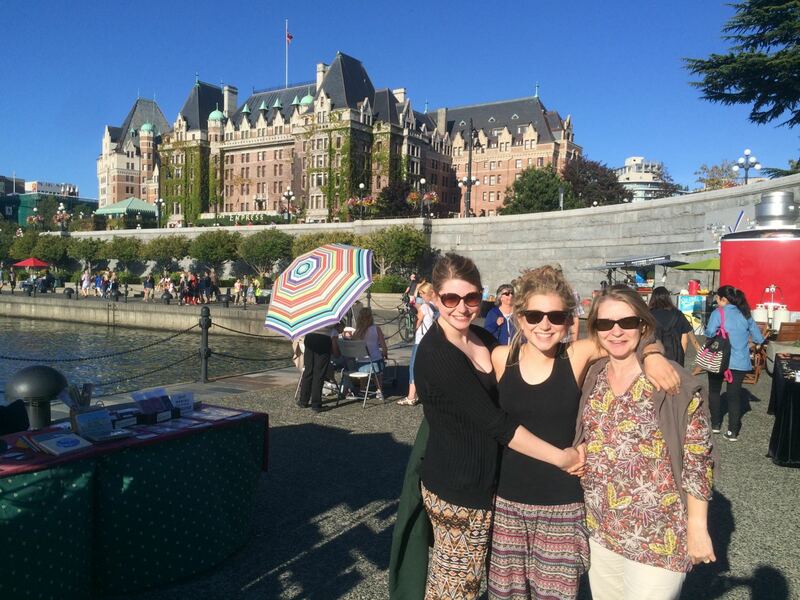 Me, Rosie and mum in the port of Victoria, Fairmont Empress Hotel in the background. While we were there we explored some of the streets and did a bit of shopping. For some reason there are loads of places selling really extravagant toffee apples? 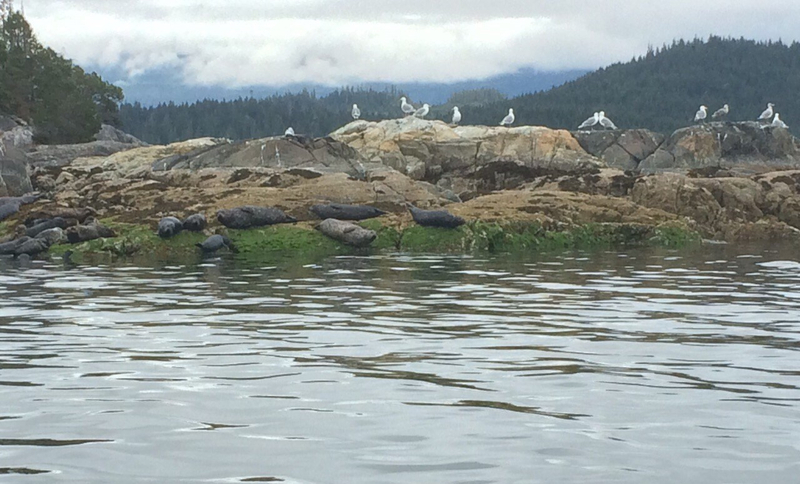 But the main reason for our journe down from Deep Cove was to go whale watching. 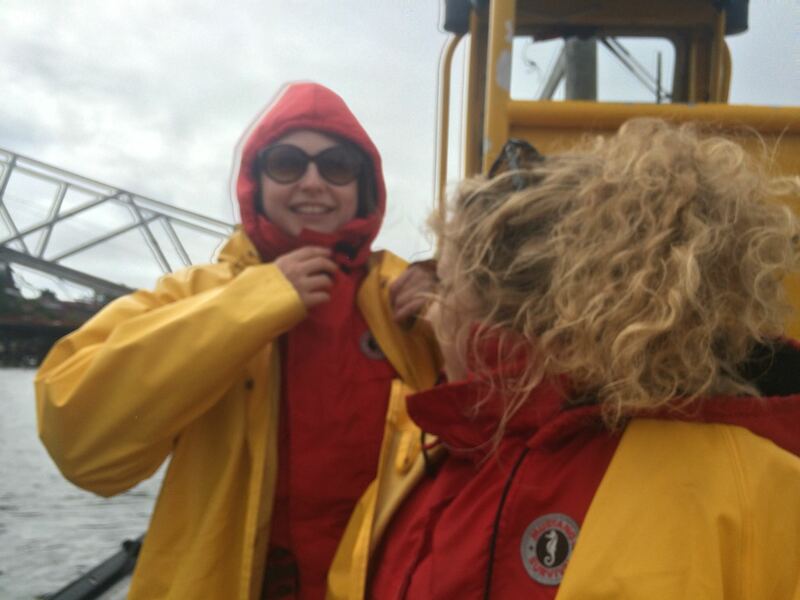 Kitted up and ready to watch some whales. The Prince of Whales (geddit?) 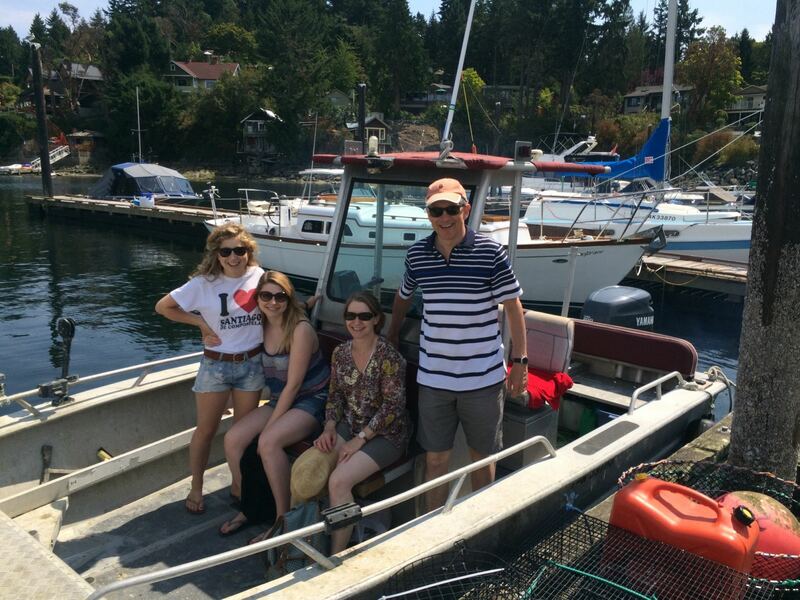 “Zodiac Whale Watching Adventure” is a 3 hour trip on an open air boat with only 12 passengers, that takes you up the Haro Strait and the Strait of Juan de Fuca in search of whales. 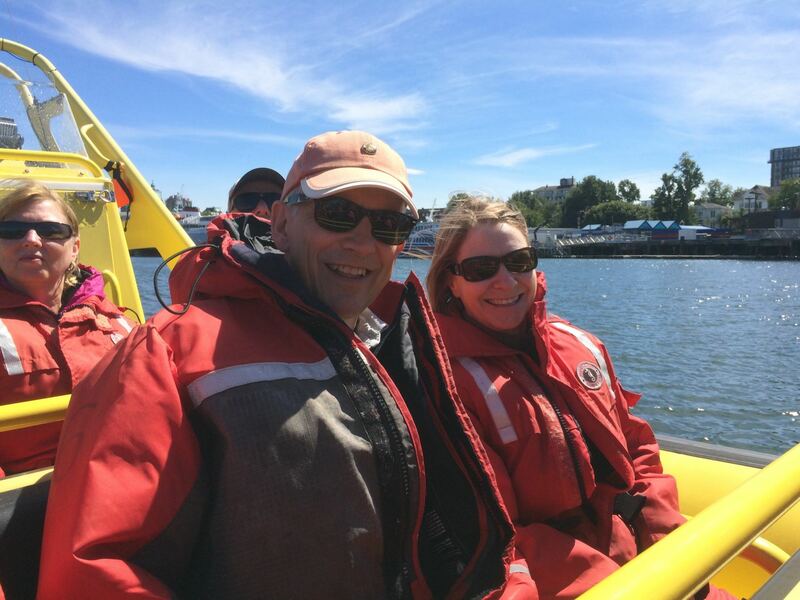 Dad and mum (before mum realised no amount of whale was worth the seasickness). When you put on your full body jump suit in the summer heat, your first thought is, really? We need these? But then you get out on the water, the boat hits full speed and boy do you need them. Me and Rosie on the zodiac, still in port. On our trip we saw dolphins and seals, and when we got to the Strait of Juan de Fuca we were lucky enough to stumble across two families of orca that were showing off for each other. Technically the boats aren’t allowed within a certain distance of the whales, but these orcas were so playful they came right up to our zodiac and jumped clean out of the water. Top tip: It’s worth checking with the company what the water is like the day you go on your tour. We were warned beforehand that the sea was very choppy, and I think if mum could give you her advice it would be to play it safe and sit it out if the water’s rough and you’re prone to seasickness. On our whale watching trip our zodiac actually went right around the Victoria Golf Club, since it overlooks the Strait of Juan de Fuca. Established in 1893, it’s now the oldest golf club in Canada! 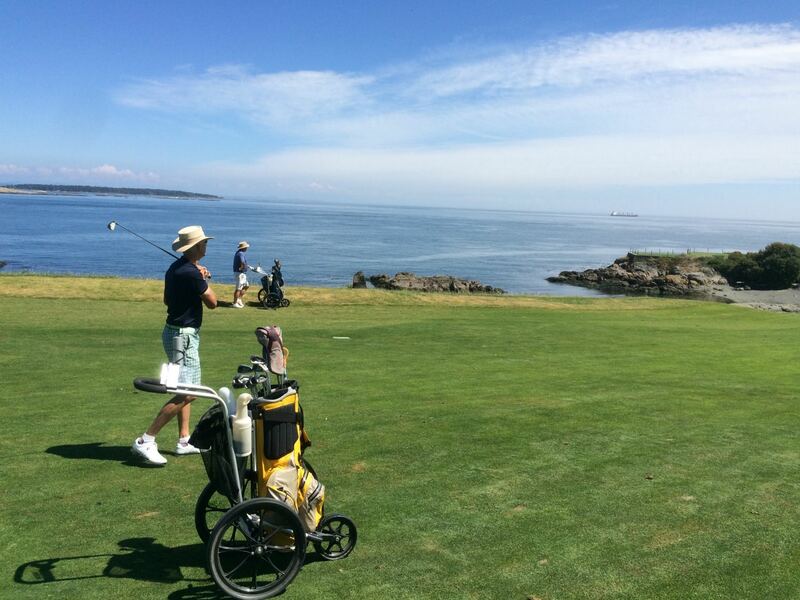 Amazing views from the course. Dad was lucky enough to be invited to play by Alistair’s friends. The weather was beautiful and they could see all the way out to the horizon, where the spotted a few seals and dolphins in the water. 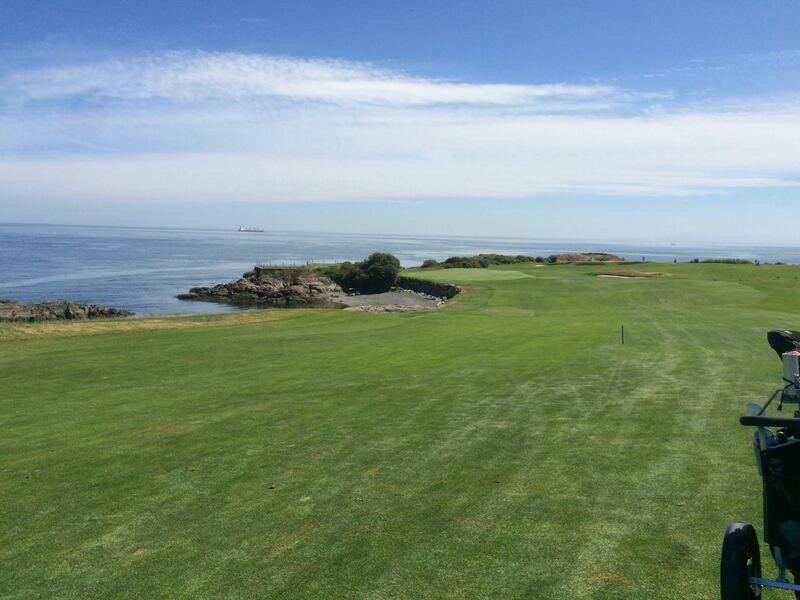 The Strait of Juan de Fuca from the fairway. 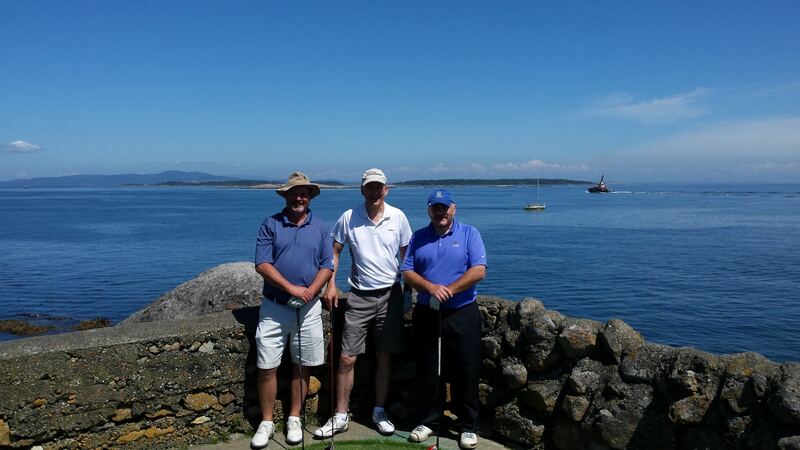 Dad and his new golf buddies. 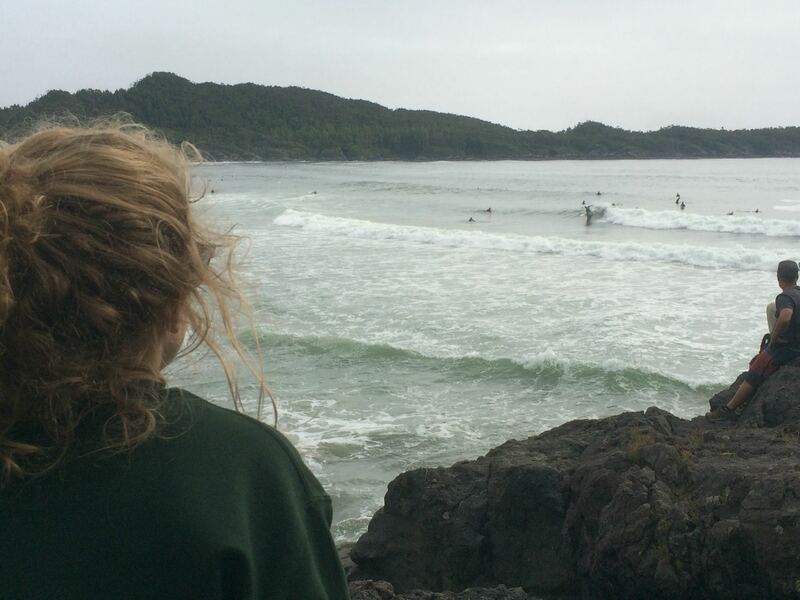 We spent the second part of our trip in Tofino, a relaxed surfing town on the tip of a peninsula within Clayoquot Sound. The wild natural scenery includes lakes, inlets, ancient rainforest, and sandy beaches, all part of the Pacific Rim National Park Reserve. The quaint vibe of the town is helped by a local agreement that stops big chains from buying property, which means all the shops, businesses and restaurants are authentically local. 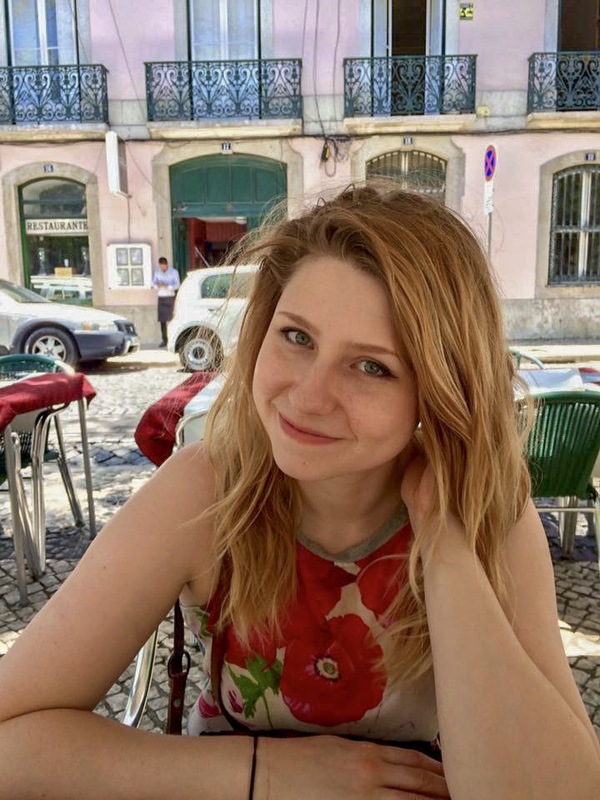 We were there for a few days and our favourite places to eat were Wolf in the Fog (a higher end restaurant with a delicious locally sourced menu) and Rhino Coffee House. 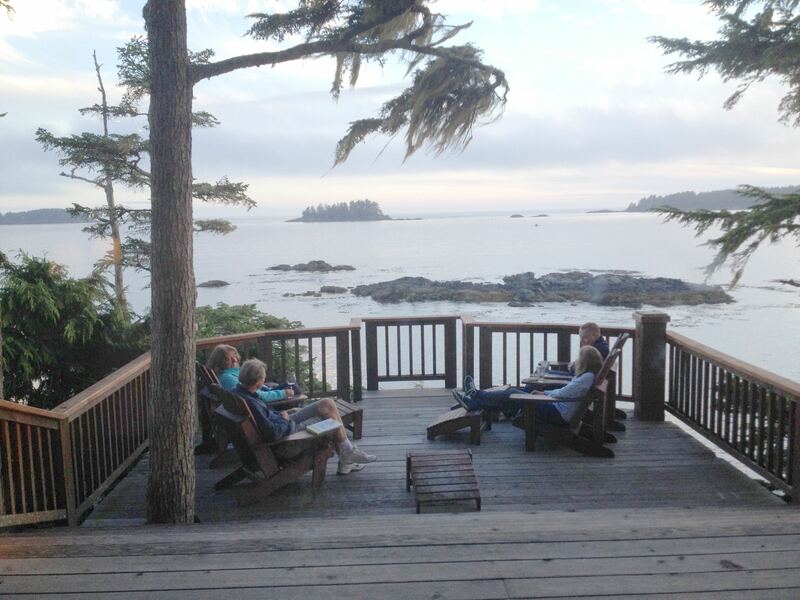 We stayed in a cabin at Middle Beach Lodge, which turned out to be the perfect oceanfront accommodation. The main lodge near our cabin was were we ate our complimentary breakfasts, and played board games on blustery evenings overlooking the water. The balcony of the main lodge. 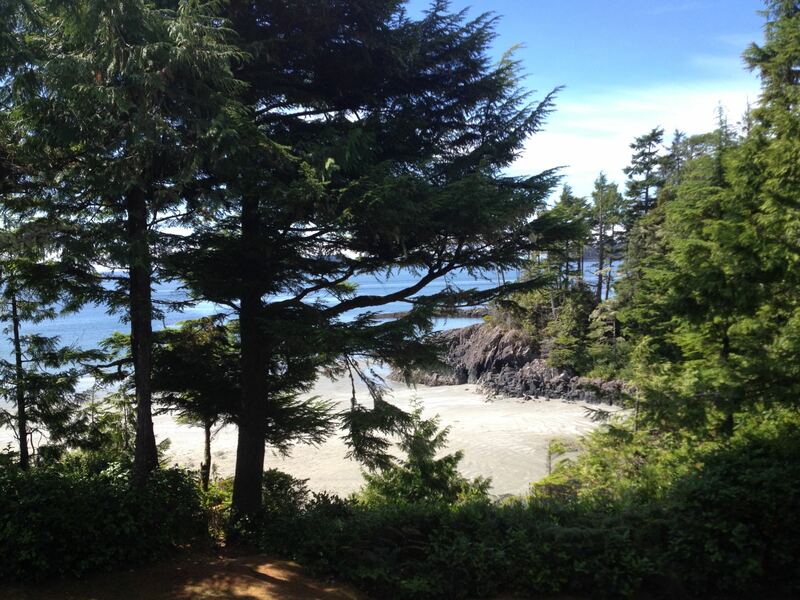 Just outside our cabin door was almost a mile of private beach and rugged headlands, sheltered by fir trees. The view from our cabin balcony. The beach just a short walk from our cabin. Surfers making the most of early morning waves. 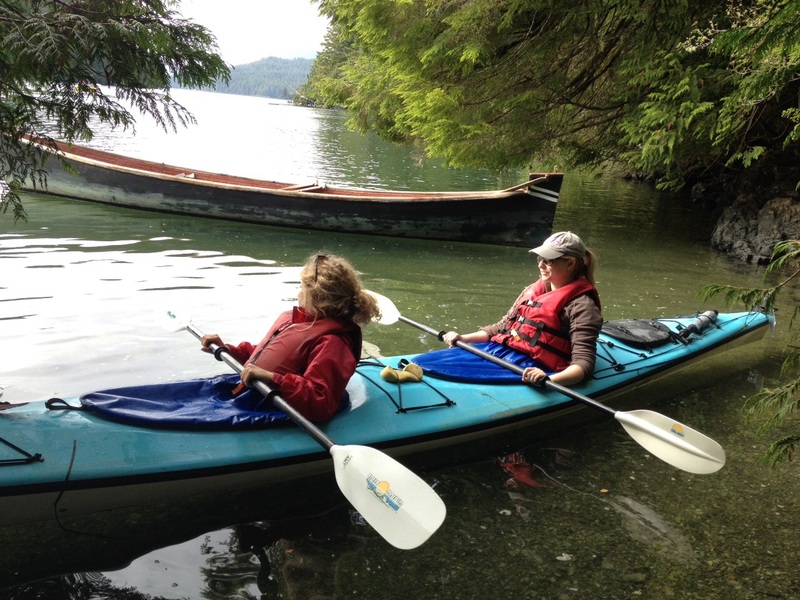 Our days in Tofino were mainly taken up with outdoor activities with Remote Passages Marine Excursions – a company that Rosie’s friend Mel had worked for on her year abroad. 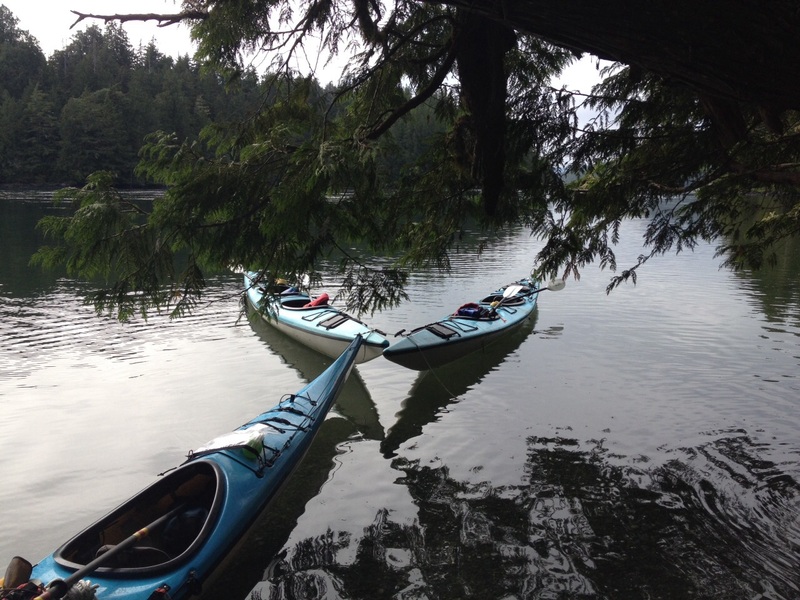 Tying our kayaks up to explore Meares Island. 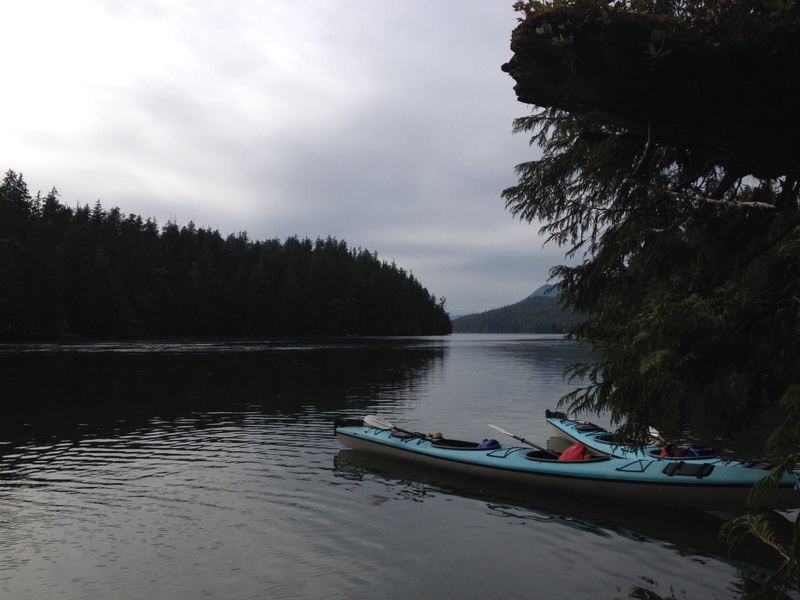 We started with kayaking around the beautiful Clayoquot waters. We had three kayaks between us – one for our guide, one for mum and dad and one for Rosie and I. The guide showed us how to prepare our kayaks and we did a practice run on the pebble beach before pushing off into the waters. 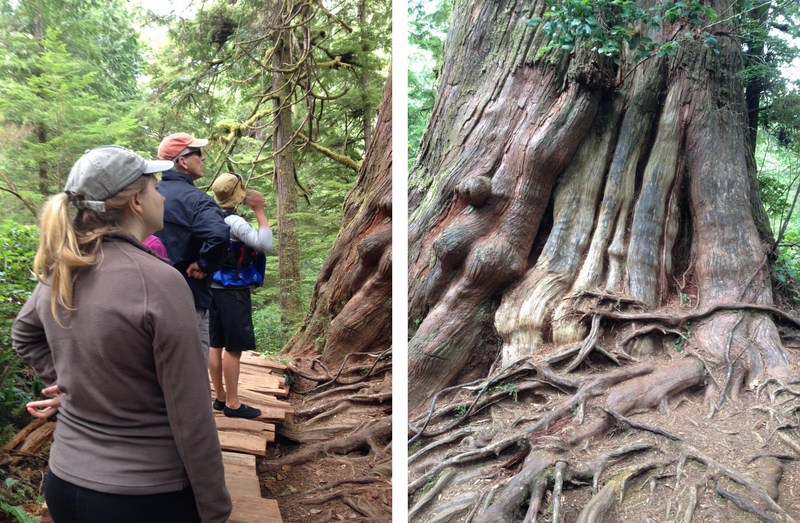 Walking the Big Tree Trail on Meares Island. We stopped at two islands on our trip, tying our boats to the roots of fir trees on the shores before setting off through the woods to find the trail’s rustic boardwalk and crane our necks to look up at the ancient trees. Our guide told us all about the life cycle of the rainforest and the long process of building the boardwalk, before leading us back to our kayaks. Me and Rosie in our kayak. 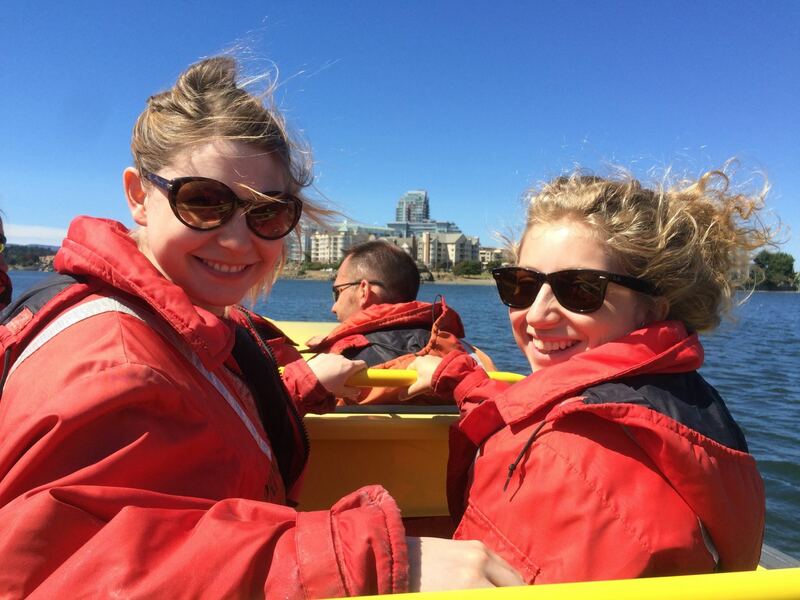 On our journey back to Tofino Harbour, we paddled through a field of seaweed floating on the surface of the water. Our guide tore some loose and started to chew on it. “Go ahead! It’s really good for you!” he called out to us. Since I had a reputation to protect as raw shrimp eater I decided to give it a try. It was rubbery but very fresh, kind of like the seaweed you get on the side of sushi platters. Our kayaks tied together safely. The next day we were bear watching. The boat we were taken in was a very similar zodiac to our whale watching excursion in Victoria, but mum didn’t need to worry this time. 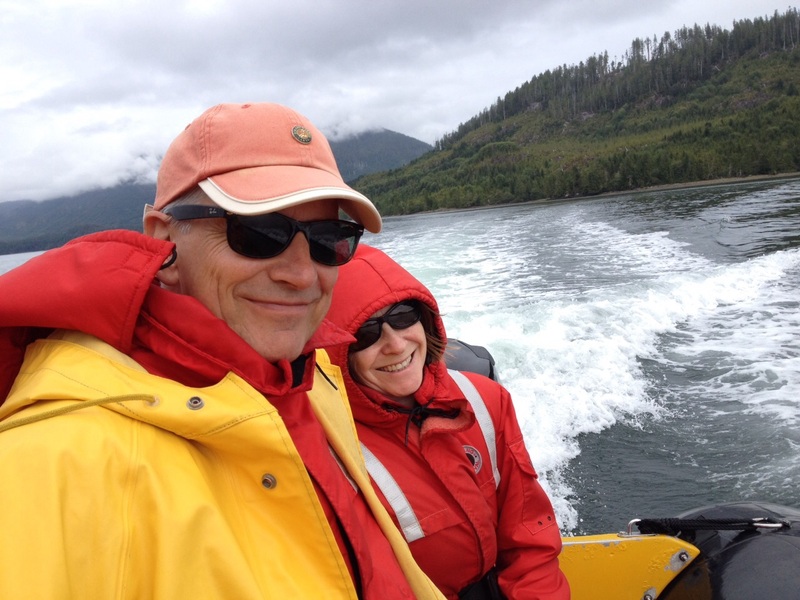 The water was still as the boat took us quietly up fjord inlets and stopped in sheltered bays to look for black bears. Me and Rosie preparing to see some bears. The bear watching boats all communicate with each other, so when a bear is spotted there will be a few boats that arrive from different companies. We managed to see a whole bunch of bears. They’re not skittish like you would expect, because they have no natural predators that would come from the water, so they aren’t afraid of boats. Mum and dad in their jumpsuits again. We even saw a mother bear with some cubs! She was searching for shellfish among the rocks while they were hiding in the trees, but eventually they inched their way out and joined her. Our guide told us that even though they looked like they were hunting for crabs, they were only copying their mother’s behaviour so they could learn how to do it themselves one day. 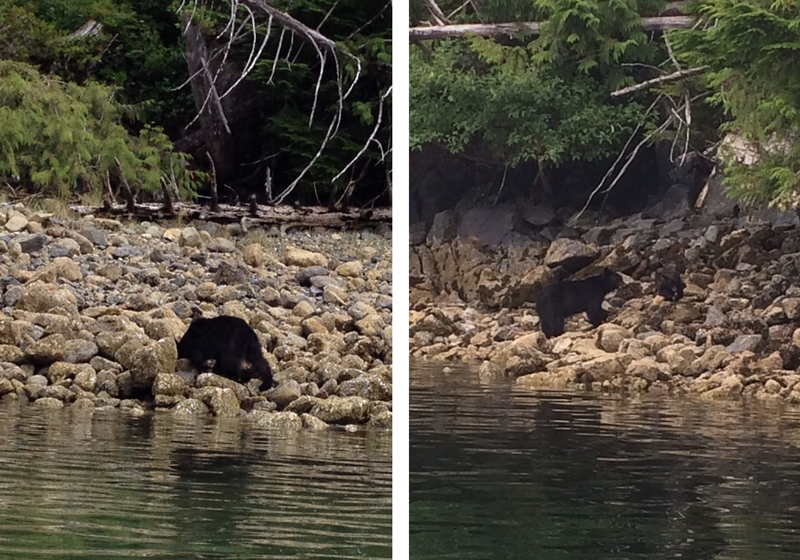 Bears hunting for shellfish by the water. He also told us that a female bear’s body decides how many cubs to have during hibernation based on how much food the mother has managed to eat that season. If she can’t spare the body fat, she won’t have any cubs at all. Every day’s a school day! 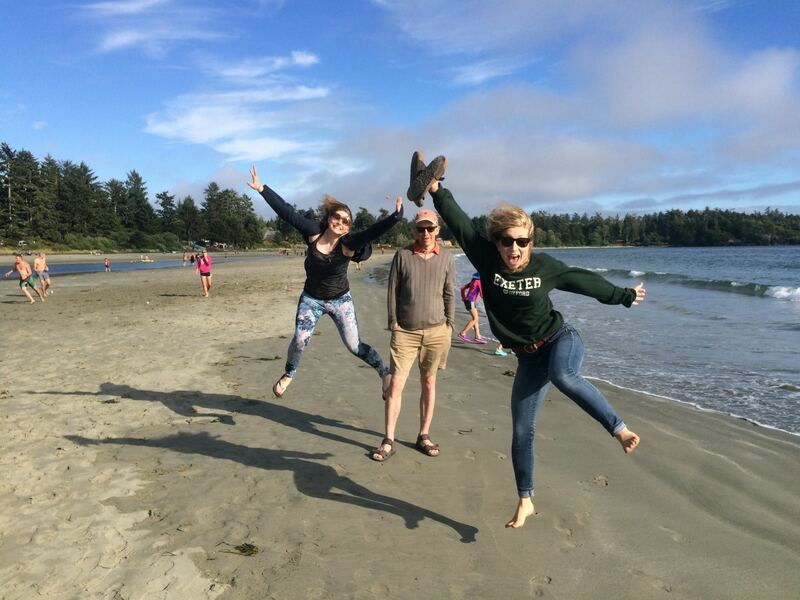 Vancouver Island is definitely a destination for activity-loving families. I don’t think we’ve ever had a holiday where we’ve spotted so much wildlife!